I love you guys. I appreciate all of your support and so I am having a giveaway. I am thankful to be at 98 GFC followers. I am thankful that I have 75 facebook followers. I am thankful for all of the kind comments. I am simply thankful for you guys. I love doing this, and it makes it all the more sweeter to have people along for the ride. You must be 18 to enter and it is open internationally. Good luck!! Wow thanks for the great giveaway! I didn't know you had your own Etsy shop! I really like The Princess of Power! Love the mix of red, yellow and white glitters! Thanks so much!! Its brand new...I just opened last week :-) good luck! 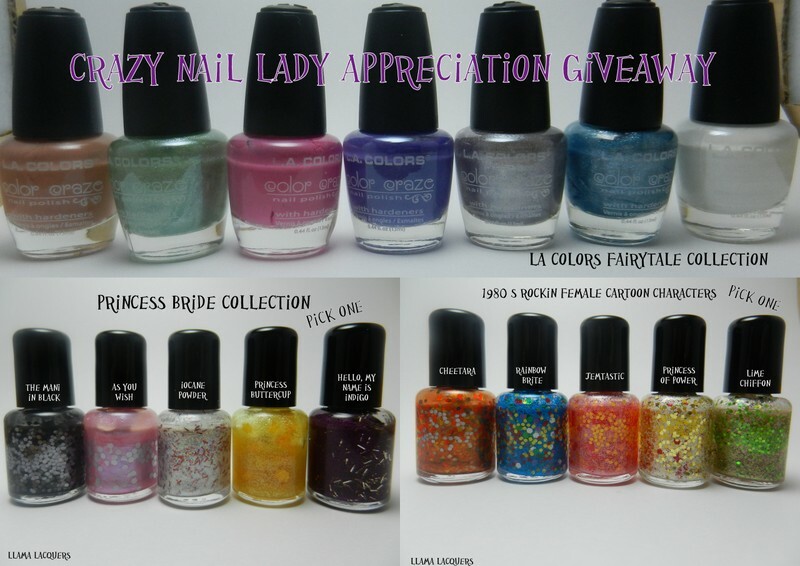 thnx for d giveaway.. wow i didnt knw tht u make polishes ... nd i like many of them when i checked ut etsy shop.. u ships from uk ?? So glad you like it! It was the first polish I ever thought of :-) Good luck! Can I just come over and you paint my nails before Christmas? Thanks! I love that one too!! Thank you! And your welcome!! I'm loving Rick Grimes Zombie Killer! It's perfect! Congrats hun! I need Llama Lacquers in my life! I really love Rainbow Brite! Thanks for the chance to win these awesome polishes! I am loving my Mani In Black! I used it over black polish & added some pumpkin nail stickers. The pumpkins look like they're under twinkling night skies. I'll see what I can do. I'm still wearing it! Also, please disreguard any dup giveaway entries? I had to go thru the whole process again to add my 'share this' info. I love all the 80's collection I can't seem to choose just one lol. well I've never seen any so I'm not sure! My favorite is "Hello, My Name is Indigo" if only for the name LOL the polish looks awesome too! As you wish is GORGEOUS! As you wish looks lovely. I love Lime Chiffon. Thank you for such an awesome giveaway. Thank you! I think Lime Chiffon is very unique! and your welcome!! Thanks! It is quite girly isn't it!! As You Wish is my favorite! I like rainbow brite. its so beautiful! I would have to say Rick Grimes! Its a gorgeous green glitter polish! Rainbow Brite is my favorite! So colorful! My favorite is The 'Mani' in Black!Classy! I like the look of Princess of Power. Thank you! and Your Welcome! Love Rainbow Brite. Thank you for the giveaway!!! Su bienvenida! Sí, usted recibirá un correo electrónico si su victoria suerte :-) Bueno! YEAH!!! I can't wait to see it :-) I have another new collection coming out this weekend. Beautiful girly colors! i like As You Wish!! Thank you! This is fast becoming everyones favorite! Thanks for the lovely Giveaway. I love both the sets of Llama Lacquers. But my favourite one is Llama Lacquers Rockin 1980's Female Cartoon Characters. Good luck and thank you! I love the colors in that collection! I love rainbow brite! I had no idea you were on Etsy. Hope you start shipping internationally soon! Your not going to make me decide, are you?!?! This is going to take some time, LOL. Thank you so much for the lovely giveaway! Llama Lacquers are new to me, but they're all just beautiful!! You're welcome! And Thank you for the lovely compliment ! Rainbow brite and the mani in black! Thanks for the giveaway! I love Rainbow Brite! Rainbow bright is amaze. Thank you so much for a chance to win!!!!!!!!!! Well, thank you so much! And good luck!! Oh babe, it's awesome! You seriously made my day!!! I'm liking Strawberry Susie! Great giveaway!! Rick Grimes is my fave! Followed by as you wish and princess buttercup! Great giveaway! They are all lovely! Thanks! I love that one a lot too. Thank you! Hello My Name is In(d)igo!